As before, it is based on my own measurements of my car with Tien S-tech springs, which lower 1.5" according to Tien. Stock is based on raising the car 1.5" from what I measured. 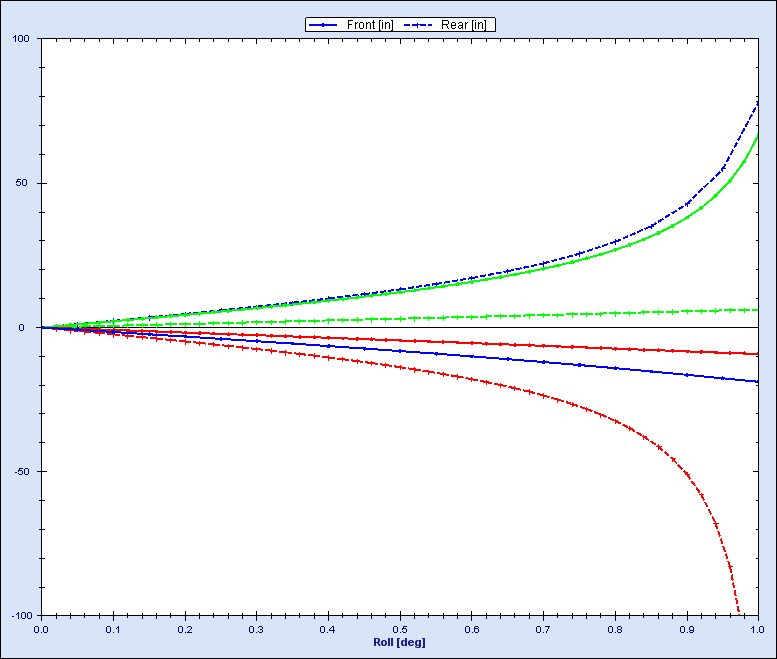 Green = stock, red = lowered 1.5", and Blue = Lowered 1". As before, body roll is to the right, aka car is in a left hand turn, so the right is the outside wheel, should be the dashed line in the graphs. As with the rear analysis the choppy parts of the graphs are due to the program not knowing how to handle excessive roll center migration. The first thing I noticed with the front is that lowering it actually REDUCES roll center movement compared to stock. This I found to be very strange, but as far as I can tell my model is fairly accurate. I'm really not sure what is so different about the front geometry that this occures. One thing not shown on any of the graphs is the actual location of the roll center. Stock it is about 1" above ground level and when lowered 1.5" it is about 3" below ground level, so you can see how it drops siginificantly more than the CG when you lower. Another interesting thing about the roll center. Stock, it moves toware the inside of the turn. When lowered it doesnt move as far, but it now moves toward the outside of the turn. The other strange thing is that it APPEARS from these graphs that if your going to lower the front you are better off lowering it more rather than less. Dropping it 1.5" seems to have a better effect on roll stiffness and roll center movement than does lowering only 1". The front seems to experiences a reduction in roll stiffness when lowered, just like the rear. 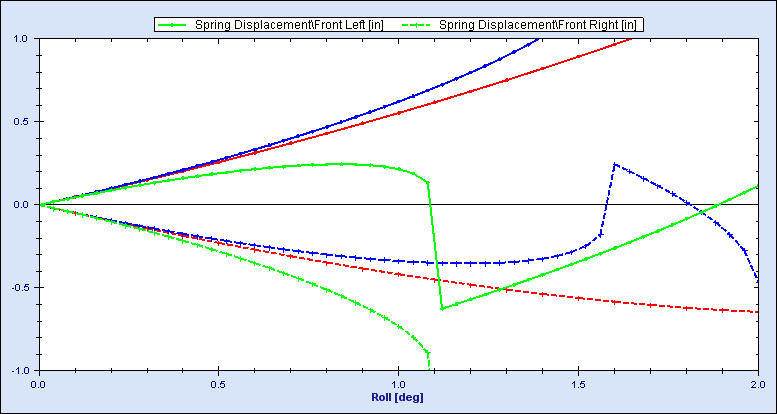 However, it doesnt appear to be quite as severe, and in fact the spring displacement vs roll becomes very linear when you drop the front 1.5", compared to the rear where it was linear stock. As with the rear, lowering has a slight negative impact on the camber curves. The front appears to toe in the direction of the turn, and lowering only increases this tendency. Not a big deal either way in my opinion. This is where things get a bit crazy. As you can see, at stock height the front roll (Solid Line) center moves quite a lot, the rear (Dashed Line) hardly moves at all, and both move toward the inside of the turn. Lower it 1" and now the rear moves a lot and the front moves a little. The rear is still moving into the turn, but the front is now moving OUT of the turn. Lower it even more and now they are atleast moving in the same direction, rear still moving a lot, front moving not quite so much. Now, if this is right this will cause the roll axis to swing out in the rear and stay centered in the front when lowered. This should tend to cause the rear to lift (due to roll) when lowered, increasing oversteer. Stock the front swings out and the rear stays centered, which should lift the front, reducing oversteer. Sound right? Last edited by Alex W; June 7th, 2018 at 08:15. I'm going to post in spurts here, because I'm learning as I go. Alex, I'm getting the same results you are, so I think we're both in the ballpark. Thoughts on the wierd roll center migration. I believe this is a function of the angle between the control arm and KP going past 90 degrees, moving the IC to the opposite side. I think this is bad for many reasons, the simplest is you are losing camber more rapidly. Looking at it closer, you have a car who's roll center is near the OUTSIDE wheel. If this is correct, and not just a theoretical glitch, i'm not sure you want the chassis pivoting around the outisde wheel in a turn. I wonder if this is what causes cars to get up on two wheels? My guess is anytime your IC's are on the same side as the suspension side you are analyzing, you're in scary territory. This would NEVER happen on a properly setup SLA car. I'm not sure calculated RC info is valid at this point, which is probably why your program pukes. Which is odd also, because my program (Susprog3D) seems to handle it ok.
 My point is, I'm not sure we should see the RC movement on the 1.5" lowered car as a positive. Randy, thats really good to hear that you have gotten the same results on this. As for the movement, I think you are right, its something you will only see on a strut suspension, or atleast never on a double a-arm setup. When I was designing the suspension for our SAE car I never had any issues with roll center migration, it just moved slightly within the confines of the wheel base. If anything what we might need in front are roll center adjusters that are larger than the ammount of lowering. I will need to test this theory, but I think it should limit the roll center movement that we see at stock height, which might be a good thing. Make the front more like the rear in that respect. Alex, I'm a step ahead here I think. Slap in a 1" RCA and move the strut top inward 2-3". I got RC in the +3" range, 24" lateral migration and -2" vertical at 3 deg roll, and a camber curve that would make even an SLA guy stop laughing at us strut folks. oh, and right now my model is only lowered about 1.5", but I expect the car to be probably an inch lower than that once we get it put back together. will that be to the point that you can't engineer enough grip out of the rear to keep the balance? As an example, heres what happens to the roll center when you put a 1/2" RCA on the front of an otherwise stock car. Green is stock, orange is stock with the 1/2" spacer. It makes the front behave almost exactly like the rear. From that point, lower and compensate with equal thickness RCA's and you should have it made. Last edited by Alex W; November 9th, 2018 at 08:58. Ah... the black art of suspension analysis and design. 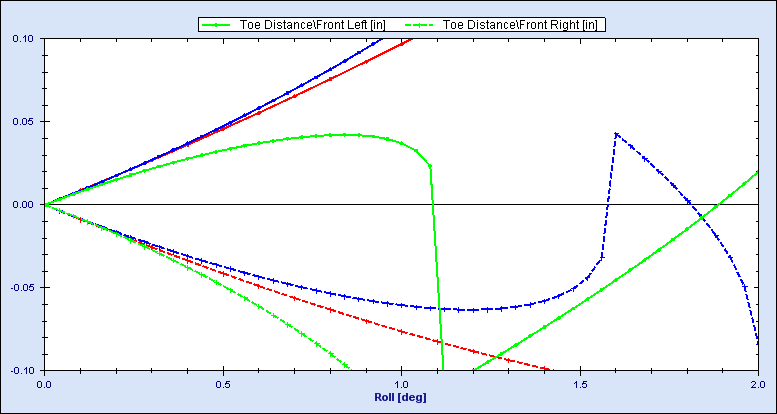 I've also done FSAE suspension design and it's caused me to almost hate the subject. I'd be much more curious to see how the RC moves vertically. I mainly look at RC tuning as a way to adjust the transients of the suspension. For example, if the RC in the front is below the ground (or the IC for the outside wheel is below the ground and towards the inside of the turn), then the jacking force generated instantly reduces the vertical load on the outside tire. Since it turns out that the load sensitivity of race tires is actually backwards under transients (though this is debatable) the reduced download on the outside tire at the point of turn-in will reduce the grip available on the front to initiate turn-in (which is really usefull in autoX). The pure geometric suspension analysis only tells you a small part of what's going on. The car in reality doesn't roll about the RCs. For example, the front RC doesn't matter when the car starts to tripod, you might want to look at the individual IC for each wheel. Start looking at the instant centers for each wheel and see what that does for the jacking forces and for stability/instability with changes in cornering load. With the ICs you can transfer weight instantly with a change in cornering force. So what do I think? I'm a little bothered by the discontinuities in the data. I'll do some more thinking once Randy posts up his data. I know he has shown it to me before, but I always have to think real hard for a long time on this stuff. Ok, here comes the junk. Toe is in inches, Camber and Caster are in degrees. RC and IC info is in inches. My IC's also puke because they go infinite at the point that the LCA to KP angle is 90 deg, but RC and all the other measurements stay on course. Now here's what I think my car will look like. Lowered approx 1.5", similar diameter front tires (23"), 1" RCAs, and moving the strut top inward 3" standing the wheel back up at the knuckle. 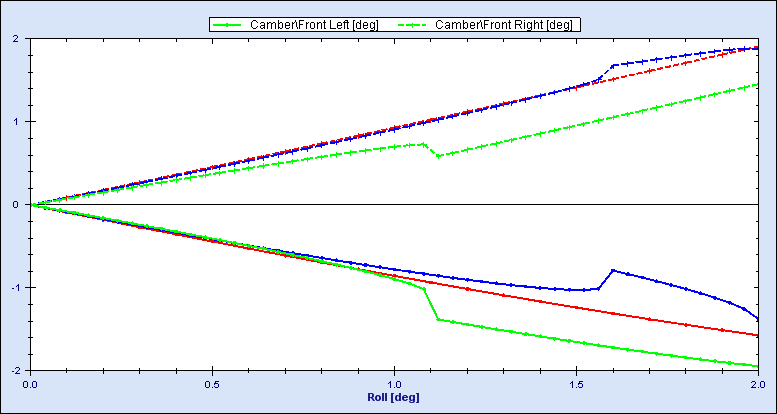 Notice specifically how the camber curve, though it does start with more camber, loses camber less quickly than stock under roll. Also note that the RC and specifically the ICs are more in check. I have been thinking, trying to figure out how to fix the geometry, in the rear especially. It seems to me that the easiest way might be to make a custom crossmember (or modification of the stock one) that moves the inner mounts (or atleast the one for the toe bar) up an inch. I will have to check it, but I think that moving the ball joint down and the inner end of the toe bar up will have the desired effect. Or would something like that not be SM2 legal? One thing that really baffles me, and kinda makes me wonder how important all of this is (or maybe makes me question my analysis) is that when I run the front at 93 ride height the roll center movement is 10x WORSE than anything else thats been posted here. 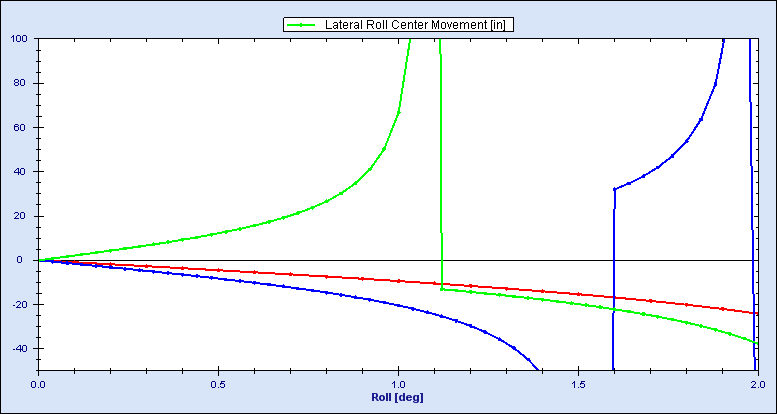 So either roll center movement is truely meaningless, or I have something wrong in my setup. Heh, oops, i ran my front at 93 ride height. My measurements aren't exact either. I measured my car lowered and on 18s and then backed into the stock numbers. Subframe is off limits in SM2. But the real issue would be that you'd have to do some serious modding to raise the inboard tie rod pivot 1" and not contact the actual frame rail or whatever subframe you fabricated. I'd probably rather go with a bigger RCA. I'm looking at that now and it looks like a 1.5" RCA and moving the strut top in 2" is about the best I'm gonna be able to do. If I lower more, maybe a 2" RCA. If we could lay the rear struts down as far as the front I think we'd be in better shape. I think the Spyder lays them down more stock. I'm thinking your program is getting snagged hard on the IC side-swap. Mine just puked and I think it was because it hit a calc point where the IC was infinite or just too dang big. My program only calcs every 0.5" of bump and every 0.5 deg of roll, so if I make minor adjustments it skips over the infinite calc point. Well, I just ran out to the garrage and tried to re-measure the one point that I was a little unsure of, mainly because its location doesnt really make sence (the verticle position of the front ball joint). If anything, I think I had it maybe a little bit too LOW in my original model, but it was certainly close. Regardless, it begs the question, WHY did toyota design it that way in the first place. At stock ride height the lower control arm in the rear has a slight downward angle, about 1" of drop by my calculations / measurements. But the front is parallel with the ground even at stock 91 ride height. Even lowering it to 93 specs causes the LCA to begin to point upward. It certainly doesnt seem to be an issue of space, they could have easily spaced the ball joint down, just like they did in the rear (the rear ball joint is significantly closer to the ground than the front). About the rear knuckle adjustability, yeah, thats a tricky one, I have been trying to figure out a solution to that one for quite a while now. I think the front is closer to how they would've designed the rear if that darned engine wasn't in the way. I can't see any good reason to mount struts straight up and down. It looks like you need some decent angle in them to get close to good geometry. In reality, they probably had a bunch of Camry parts sitting around and used the cheapest possible way to get them to fit on our cars. Our rear probably looks a lot like the Camry front. Our front probably takes after the MK1 which was probably designed specifically for the car, since it's the only front end without an engine in it. Or maybe they took the geometry from some old FR Celica or Supra. I agree on the strut angle, the front has that better, but it seems to me that the angle of the LCA is better in the rear. Or are you saying that because the struts are layed over more up front the LCA can afford to be more horizontal because it keeps the angle between the strut and the LCA the same? Even so, it seems that the front would be better if they had a bit more angle to them, like the rear does. 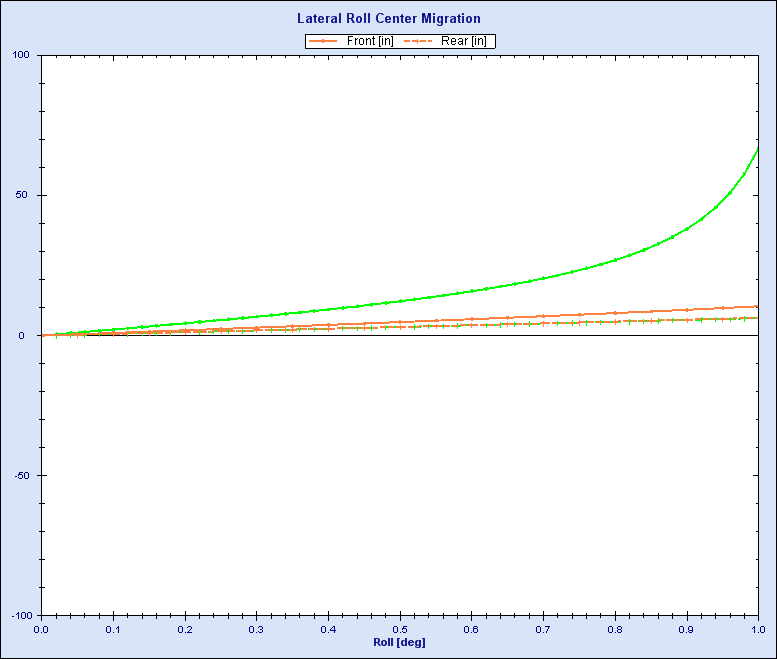 Alex, I really think IC height has more of an impact on 'funny handling' than roll-center migration. I spent A LOT of time mulling over all this stuff and trying to justify it during my FSAE days. Toyota honestly probably didn't spend much time perfecting the stock geometry. They were probably more concerned with packaging and using off the shelf components. Study a modern porsche 911 if you want to see a less compromised MacStrut suspension. There have been millions of dollars of smarts put to trying to make stock-ish 911s go around a track as fast as possible, and they seem to do a good job of it. I think the idea was to figure out where it is to know what needs to be tweaked to make it "right"
Well speaking for a weekend lapping junky, I am taking the plunge to coilovers to gain a little better handling. I want to know what the right ride height is to maximize this change. In terms of 3-wheeling, I think that is more a function of spring and sway bar stiffness than anything else. VW GTIs always 3 wheel it in corners if you are on the gas and then lift. I also agree that Porsche has spent tremendous amount of R&D getting the strut suspension dialed in. That's why it seems like as you lower Porsches, they go faster. But this is not the same for the "people's car" which loses performance as you lower. BTW, here's a little shot of the last track session. I don't think 3 wheels hurt his cornering. Last edited by traffic; December 31st, 2007 at 11:20.
a. Changes camber curve to one that gains positive camber as suspension compresses, thus pushing the front. b. As the lca moves below parallel, it takes the suspension out of the sweet spot. Since the suspension is out of sweet spot, cornering forces are adding to compressing the springs. This takes away suspension travel that could be used to soak up bumps. I realize this is probably an oversimplification, but that is the "affect" (or is it effect?) that I am feeling. Why it's doing that, I'm hoping the modeling and simulation could explain. Now granted tires and alignment plays a significant role. But the gap between #4 was not that different from #2. The gap between #3 and #2 was pretty significant. (#1 wasn't pretty on the track. It was fun and got by, but definitely needs some help in stiffness to get in the ballpark.) I feel that the ride height played a partial role in closing the gap (that and tire selection.) The #2 setup had slightly lower than JDM TRD ride height.